By Laure-Anne Viselé, Interviewed May 2011; Released July 2012. This interview is part of a series of talks with dog professionals from around the world. I’ve interviewed behaviour-curious vets, certified dog walkers, assistance dog trainers, dog scientists, etc. The series gives you a fly-on-the-wall view of the world of pet professionals. I also wanted to showcase the diligent pros, the deserving few, the good students, in today’s highly unregulated pet care industry. Monique has published a book on dogs and cancer and co-owns Team Dier, a thriving pet care practice in the Netherlands where she practises as a behaviour therapist for domestic dogs. She has gleaned skills from her other careers with communications and journalism, has studied alternative veterinary medicine, and is graduating from one of the most science-focused behaviour certifications. So Monique is unique in the fine balance she has achieved between scientific and alternative methods, with an academic background heads and shoulders beyond scrutiny. Read on to find out about a very inspiring dog career indeed. LV – Judging by the quality of your writing, you are clearly very well-read in the field of canine behaviour. How did you gain that knowledge? MB – Way back when, I certified as a Behaviour Therapist through DogVision (previously called ‘Van Hall’). Johanna van de Borg, who co-founded it, is an ethologist. This is reflected in the scientific focus of the curriculum. She is known for her research on electric collars (concluding that it increased stress levels in the tested animals). One of the more interesting point about their curriculum at the time, is that covered divisive subjects (e.g. punishment) in a balanced way. I then completed my practical placement with Barneveld (now Quiebus). And of course, I also did the “Omgang Hond” applied training courses with the O&O [LV note: Passing the O&O is to dog trainers in the Netherlands what passing the Bar is to lawyers. It’s a rite of passage and a very important accreditation]. I also studied alternative veterinary medicine (a five-year course). It’s about herbal remedies, aromatherapy, homeopathy, t-touch, massages, etc. for pets. My thesis was about the possible relation between the introverted character of a dog and the probability to develop certain types of cancer. That idea eventually contributed to my book, actually (but more on that later). Right now, I am completing a Post-graduate qualification in Applied Animal Behaviour (Toegepast Diergedrag postgraduaat). It covers a wealth of topics, from ethology to ethics, at great depth. It also features many interesting guest speakers and seminars. The curriculum addresses issues with many animal species, not just the domestic dogs. The qualification requires very high standards of its students, though, and is as scientific as it gets. So it is a lot of hard work. LV – Talking of the O&O, I’ve just received my results (a pass, phew! ), but found out that only about 40% of my promotion made it. To me, this is a good sign. It’s not an easy qualification by any stretch of the imagination. It was nearly like a boot camp! MB – I think the O&O has always been like that. A lot of people approach it as a formality: “I’ll do that, no problem”. And then when they actually did it, they find it very difficult. LV – I am happy that I found it challenging, it is tough to distinguish between the serious programmes and the well-meaning amateurs when it comes to certifications. LV – So, do you have your own dogs too? Amy: We brought her home from the shelter in January 2011. She’s 15 years old. LV – Do they spend a lot of time with you? MB – I work from home 6 days a week, and I have a dog sitter for the one day a week that I work for another job (PR Manager for a theme park!). So they’re never really alone for hours on end. My work balance is PR job 2 days a week, and the rest is for Behaviour Therapy. I am very happy with this rhythm. It keeps my time and perspective balanced. LV – As a behaviour therapist, has there been a case lately that left its emotional mark? MB – There was this dog who couldn’t be left alone. Both his owners worked full-time. He had come from a shelter. The problem was so severe that the owners caged him, as he had almost bitten and scratched his way through the doors and wall when left alone. I told them that there was a chance this could be solved if they could stay home for at least eight week, maybe more, to gradually train it. That was out of the question for them. But I said let’s try it anyway, because I wanted to help the dog. They tried to get me to write that letter twice, and I refused twice. I never heard from them again, but I suspect they had him euthanised. That was a very difficult case. The lesson I have learnt from there is that if the owner is absolutely unable to invest the time and effort I recommend, then I do not start the process. LV – Does that sort of dead end happen a lot in your case load? MB – I have not advised euthanasia or re-homing yet but in a couple of cases, with hindsight, perhaps I should have. I always try to save the dog, and sometimes it’s just not possible. This is one of my learning points: I need to learn when to give up. LV – I have found Jim Barry‘s the Ethical dog trainer very useful resource in preparing you to deal with tough cases. It applies Ethics methodology to the situations behaviourists are sometimes faced with (euthanasia, re-homing, abuse, etc.). The book also shares professional codes of conduct, decision processes, reviews the profession’s history, and reviews the political landscape in a balanced way. So, If you had a case which you did not feel you could tackle (e.g. not your specialty), would you have someone you could refer your customers to? Have you found that gem in your region? MB – Yes, I can always refer to Rudy H. de Meester (DVM, and Dean of the Postgraduate programme for applied animal behaviour). He’s very approachable. LV – What aspects of your job do you find the most rewarding? What puts a spring in your step every morning? MB – When I see the spark of understanding in the owner’s eyes. For example, when I explain to them that their dog is not being dominant when he jumps on the couch, that he’s just trying to find a comfortable spot to sleep. When I see that, as a result, people treat their dog differently, then I think: “Ha! I did it.“. And of course, I want to help the dog, but it’s a lot about helping people. When they call me, they generally have a really big problem. For most owners, it’s a big step to ask for help. LV – Oh absolutely, and it is a trap that a lot of trainers fall into: being judgmental of the owners. MB – Oh, and it’s so important not to, because people would keep information from you for fear that you will judge them. And I need all the facts to do my job. But more importantly, the owners clearly have the dog’s best interest in mind, or they wouldn’t have called me. Maybe they made mistakes along the way, but that wasn’t out of cruelty. I always think back of when I was in the exact same position: told by everyone to interpret what a dog does in a certain way. I didn’t know any better, so I made a lot of these typical mistakes as an owner. But as I started to work as a dog trainer, a lot of the usual explanations just didn’t feel satisfactory any more, which is what got me curious about continuing my education. So when I get to a point in the case where I know I’ve done the good job for the dog, and also for the owners, then I think: “Yes!”. LV – The idea is to build solid foundations for the long-term, but can you ever offer a quick fix? MB – It’s almost never a quick fix. Some separation problems are perhaps an exception to this. They can be relatively straight-forward if people follow the schedule, and approach it gradually. I am helping a family with a 10-year-old dog right now. The dog hadn’t been able to stay alone for the last eight years. They have only been training for three weeks, and already the dog can be left alone for 1.5 hour. That’s really quite quick. LV – You got on my radar with your article about dogs and dominance. You are one of the few people I know in the region who share my view that the pack theory should have less prominence in the dog trainer’s rhetoric. MB – I think that there is a distinction between dog trainers and behaviour therapists in that regard. In my experience, most behaviourists are not swayed by the theory. But many dog trainers still consider it the root of most dog behaviour. This can lead to a focus on establishing the owner as the ‘boss’. LV – ‘Boss’ is being gradually replaced by the seemingly more balanced word ‘leader’, but I find it often insidiously used as a synonym for ‘alpha’. In English, ‘guardian’ is as close as it gets to a concept I am comfortable with. You make the rules, you teach the rules, you protect the dog from harm. MB – In Dutch, there is a distinction between the ‘boss’ and ‘leader’. I stand by the advice that you have to be the leader in the dog-human relationship. I haven’t found the equivalent in Dutch of ‘guardian’, though. But since it’s becoming common knowledge that dominance is not ALWAYS the root cause for all issues, this leaves a wide knowledge gap. It has been a slow educational process for me to gradually replace these old explanations with something more satisfying. For example, one of my dog may growl at another dog if I am petting him and the other dog is approaching, and I now know this is resource holding, but a while back, everyone would have tagged a dominance-related cause to this behaviour. LV – The dominance topic is why I find a serious specialist education so important. I really think professionals owe it to their customers to be armed with the latest knowledge and tools of the trade, and to stop passing down over-simplified views. I am not so much ‘anti-dominance‘ as I am ‘pro-fact’. I stand open to a convincing, evidence-based, peer-reviewed study that puts dominance back in the centre stage. The Cafazzo (2010) study attempted this, but it smacked of circular logic, in my view. But anyway, the pack theory is just one of the many divisive topids in dog training. I used to get on my soap box, but I found it was pointless. So how do you handle the ‘hot button topics’. MB – Yes, I have found the same thing. Some topics raise heckles. Now, I just ask questions, and I stop if the conversation is going nowhere positive. LV – A couple of organisations in the Netherlands are trying to establish professional standards for code of ethics and best practices. There is a climate of political division between many of these organisations and, as a result, being a member of one can alienate you with members of the others. So how do you pick one? You have selected Alpha, for example. How did you navigate around all the choices? MB – They were the only organisation about 7 or 8 years ago, so that was easy. They actively promote standard qualifications among dog professionals. They have also set up a complaints commission, to which customers can go in case they are not happy with their therapist. Their have a balanced view on methodology, but strongly discourage the use of punishment (they see it exclusively as a last resort). LV – It is interesting to watch the standards-setting organisations battle it out. Hopefully, when the dust has settled, the quality standards will increase as a result of this competition. LV – So how did your career evolve into what it is today? How did you get involved with dogs? We had our first dog when I was 18 and, as is often the case, the training instructor said he thought I’d make a good dog trainer, and asked if I’d join them. I started training when I was about 20 years old for a couple of years. It was still with choke collars and the rest at the time. When I think back, I did so many things wrong. But I started to notice that I couldn’t solve all the problems that the people asked me about. They would come back with ‘It doesn’t work’, or worse, they didn’t come back at all. So I started looking for courses and that’s how it all started. In parallel, I also had a career in journalism and communications. When I was studying alternative veterinary medicine, my thesis was due around the time that Charly, my Flat-Coated Retriever, got diagnosed with an aggressive kind of cancer. My thesis consisted in distributing/analysing the results of a questionnaire to detect whether there were patterns between dogs getting cancers and other factors of my selection. About 800 people completed it. I distinguished a trend among the respondents’ dogs: many described the dog’s temperament as being ‘very manageable’, easy. They didn’t bark, could be left alone, didn’t react much to other dogs, etc. I raised the hypothesis that, whilst some part of this group could be constituted of truly relaxed dogs, another element could be ‘inhibited’ dogs, which I described as “introverts”. In (human) natural medicine, introversion is a recognised cancer risk factor, so I thought the canine results were striking. The work, modest as it is, could definitely be the start of more studies in the field. 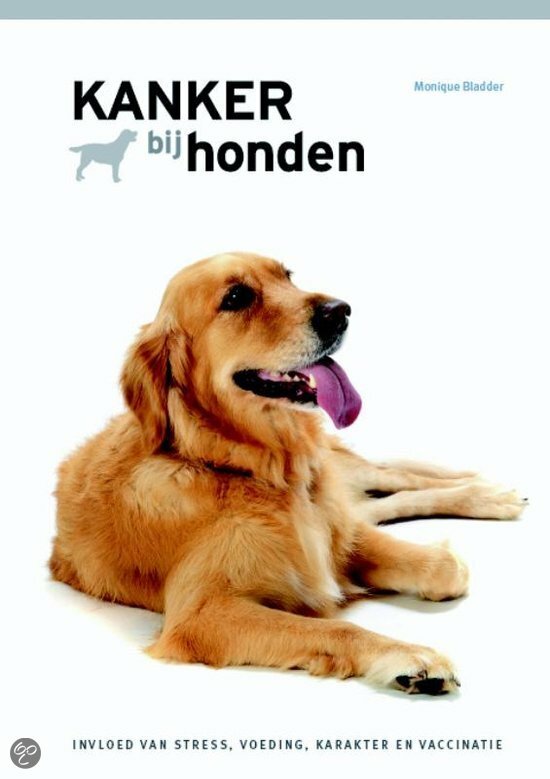 LV – Tell me more about the book (‘Kanker bij honden‘ = “Cancer and dogs”). When is it coming out? MB – Actually, I’ve just heard that it was out today (26 May 2011). But I haven’t seen it yet! LV – Congratulations!!! Well done on getting it published! MB – It’s really exciting, and I am also quite nervous. It’s now opened to such a broad audience. LV – What’s it about, in a nutshell? Prevention: stress management, vaccinations, and food. Overview of the various kinds of dog cancers. I got really triggered into the project by my vet’s reaction after we’d found a malignant lump on my dog. He said: “You could do something about it, but that’s mainly for rich people. It costs so much money, and he will only get sick from it, so if I were you, I wouldn’t do it”. LV – So, he was suggesting you take the decision based on a 5-minute consultation, with no second opinion or treatment information? Having had a cancer scare with my dog not too long ago, that sends shudders down my spine. MB – That’s right. And to think that his take on the side effects could have been part of our decision-making process when actually dogs do not necessarily get sick from chemotherapy/radiation. In our case, the cancer was not treatable, but vets should give information about the alternatives, rather than influencing people to go down the euthanasia route. Through that experience, and my thesis, I did a lot of independent research and fact-finding which I wanted to share with the public so owners hearing that diagnosis get options and information. So that’s the philosophy behind the book: to empower the owners into taking informed decisions in managing their dog’s cancer. LV – Tell me a little about Team Dier. MB – It’s run by three people: Petra van der Post, Gertruud Kaandorp, and myself. We were classmates in the alternative veterinary medicine studies. We each have our own specialty. Petra is into homeopathy. She focuses on dogs and cats, but also covers other animals. Gertruud specialises in movement and massage, including T-Touch (massages by a horse trainer now advocated for many other animals, for many ailments). She is the first dorn-therapist in the Netherlands (a field related to chiropractic and osteopathy which addresses problems with the joint alignments, particularly the hip bones.) It is very quick and non-invasive, and carries very impressive results. She specialises in horses, but also covers other animals. The three of us can apply Bach Bach flower remedies, homeopathy, and other natural remedies. If I have a behaviour consult with a that I also suspect to be afflicted by a physical problem, we can approach the case holistically. LV – That’s a really good approach, if only to use each other as a sounding board, and get a fresh pair of eyes on each case. MB – Yes, exactly! When we were about to graduate, we all found the idea of setting up our own individual practice quite daunting, so we thought that maybe we could make a group practice, so we can support each other, rather than be in competition. LV – How lucky of you that you’ve found two people that not only share your vision, are qualified, but also with whom you get on well. MB – Yes, we were definitely lucky with that. Geographically, we are quite spread out, though: Petra lives in Amsterdam, Gertruud lives in Friesland, and I live in Overijsel. But we’ve overcome the distance with Skype conferences. LV – But that also means that the team is covering a very broad geographical range in the Netherlands, so it’s as much an opportunity as it is a challenge. MB – We can help anyone with an open mind for an alternative approach. Many people have prejudices against natural medicine, thinking it a little wishy-washy. LV – Yes, I must admit, I have always had the prejudice that it did not focus on evidence-based knowledge. MB – Many people share that view, but we do approach each case using evidence and logic, but we want to keep an open mind to all the therapeutic options. This prejudice is also why I am now following this very scientific course (the post-graduate), to combine the best of both approaches. I really think that both worlds are complementary, but that they can both be excessive in isolation. That’s also the approach for my whole career: the book, my studies, Team Dier. I am taking the best therapeutic tools out of both worlds – science and alternative. About Monique Bladder: To contact Monique or one of her colleagues at Team Dier, check their website or e-mail on info@teamdier.nl. Gertruud (movement specialist) lives in Friesland. You can find their full contact details on their contact page. To purchase Monique Bladder’s book on Dogs and cancer (in Dutch), follow this link. Two sisters, two groomers – Interview with young twin sisters with a grooming salon each! This entry was posted in Dog pros: a day in the life and tagged alternative veterinary medicine, behaviour therapy, behaviour therapy netherlands, complementary veterinary medicine, dog behaviour the hague, dog training the hague, dogs and science, gedragstherapie, honden gedragstherapie, hondengedrag den haag, hondentraining den haag, laure-anne visele, monique bladder, teamdier. Bookmark the permalink. Post a comment or leave a trackback: Trackback URL.